At the 2019 bauma trade fair in Munich, Germany, RAFI (Hall A2, Booth 432) showcases customer-specific operating, monitoring, and control systems, as well as control components for construction and agricultural machinery, municipal vehicles, and forklifts. At the 2019 bauma trade fair in Munich, Germany, RAFI (Hall A2, Booth 432) showcases customer-specific operating, monitoring, and control systems, as well as control components for construction and agricultural machinery, municipal vehicles, and forklifts. Exhibits include operating panels for wheel loaders, concrete mixers, and forklifts, a robust display module for road rollers, and a snowplow input and control interface for controlling the blade, gritter, and sprayer. Two custom-tailored armrests demonstrate RAFI’s advanced design capabilities for highly integrated control technology. The SmartTouch armrest developed for a Finnish tractor manufacturer won the Red Dot Award for its ergonomic design. It contains an innovative multifunctional drive stick that enables optional full manual control of all vehicle movements otherwise controlled by pedals. Operators can individually adapt all control and operating functions via a touchscreen installed at the front end of the armrest. The second armrest shown at bauma, is used in Pistenbully snow groomers. RAFI not only integrated various sturdy, durable buttons and command devices from its extensive portfolio, but also a four-axis joystick that controls the blade movement with all degrees of freedom. This armrest is designed to withstand extreme ambient temperatures ranging from -40 °C to +80 °C. A new generation of leadership will be guiding HMI specialist RAFI GmbH into a digital future. Long-time managing directors Albert Wasmeier and Gerhard Schenk will leave their executive positions and join the RAFI board of directors in the second half of 2019. Dr. Lothar Seybold …. A new generation of leadership will be guiding HMI specialist RAFI GmbH into a digital future. Long-time managing directors Albert Wasmeier and Gerhard Schenk will leave their executive positions and join the RAFI board of directors in the second half of 2019. Dr. Lothar Seybold, who has held various high-level management positions at RAFI for more than 10 years, has been named the new CEO and technical director at the beginning of this year. His principal goal as RAFI CEO is to make the company more digital across the board, while keeping it focused on the physical requirements of the design and function of modern operating technology. 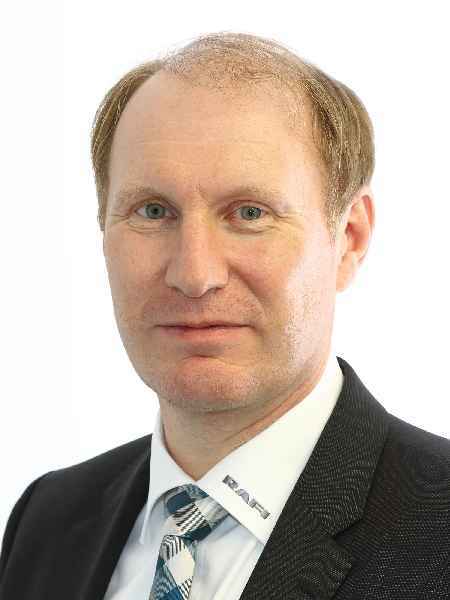 Seybold holds a doctorate in electronics engineering, an MBA, Master of Business Administration (University of Wuerzburg), and a PhD in control technology (University of Zielona Gora). He began his career at RAFI as a product manager for operating systems. In 2013, Seybold became the head of system development. In 2016, he was promoted to head of the Components and Systems business units, and focused the company on innovation management, new technologies, and improving overall customer satisfaction. Seybold has extensive international experience, having worked as a project engineer and consultant in New Zealand and Switzerland. Before joining RAFI, he worked at the software company is Integrated Systems AG, Radolfzell. Seybold is also a passionate skier. RAFI manufactures SmartTouch armrest for Valtra tractorsGerman electronics manufacturer RAFI worked in close cooperation with the Finnish tractor manufacturer Valtra to design SmartTouch armrests with a completely new multifunction drive lever for the new N, S, and T Valtra tractor series. RAFI manufactures SmartTouch armrest for Valtra tractors German electronics manufacturer RAFI worked in close cooperation with the Finnish tractor manufacturer Valtra to design SmartTouch armrests with a completely new multifunction drive lever for the new N, S, and T Valtra tractor series. 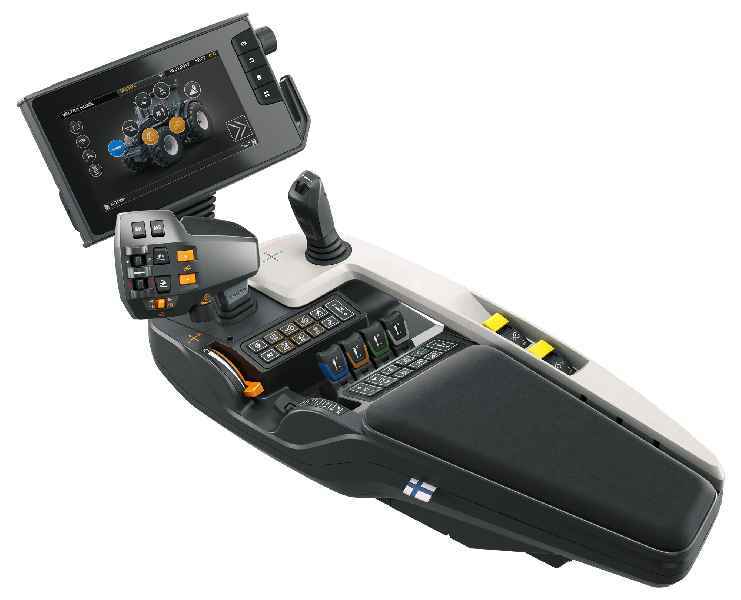 The armrest integrates all of the components for controlling Valtra’s agricultural machinery. This innovative, highly ergonomic design won the 2017 Red Dot Design Award. 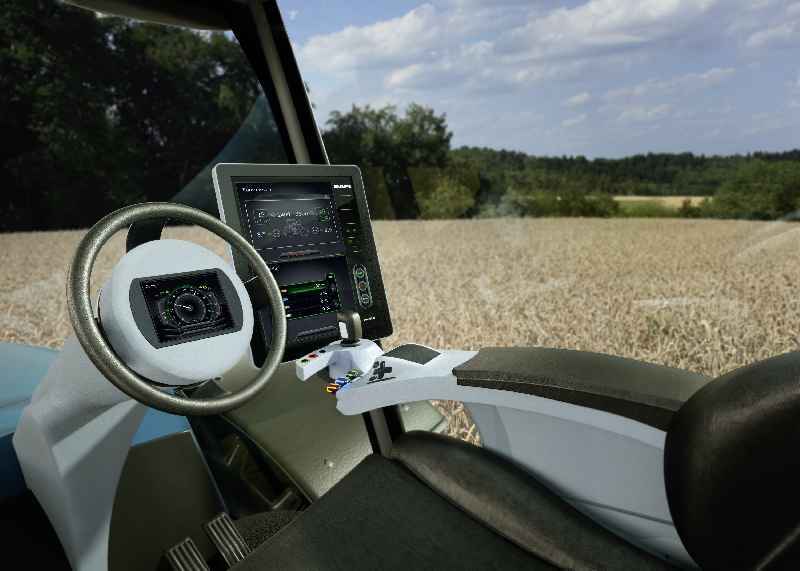 The smart armrest is an integral part of Valtra’s novel operating concept allowing drivers to customize the functionality of the controls in their cab. At the front end, the armrest features a touch screen with an interactive 3D representation of the tractor. Operators can select all vehicle functions by tapping on the model. They can set output ranges and numbers of revolutions via virtual slide controllers and, through a simple touch or swipe, assign functions to control elements according to their preferences. This includes the hydraulic system and all valves to operate front and rear loaders. Functions that are not needed can be disabled to prevent errors and ensure intuitive operation. All configurations are automatically saved and can be managed in any number of user profiles. RAFI manufactures the complete armrests including the housing and supplies them as ready-to-connect units with plug-and-play connectors. 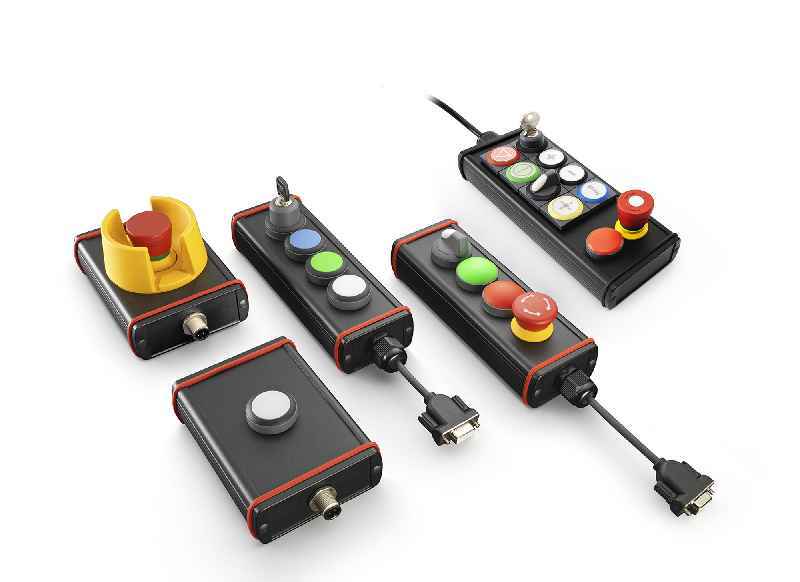 The multifunctional drive lever, the integrated thumb joystick, and the separate joystick for hydraulic control are based on RAFI’s JOYSCAPE platform of customizable joysticks. RAFI designed form, function, and colors to Valtra’s specifications. A handrest with an injection-molded soft rubber coating offers a comfortable, slip-proof hold. RAFI also integrated its own short-travel keyswitches and was thereby able to control the quality through in-house manufacturing. 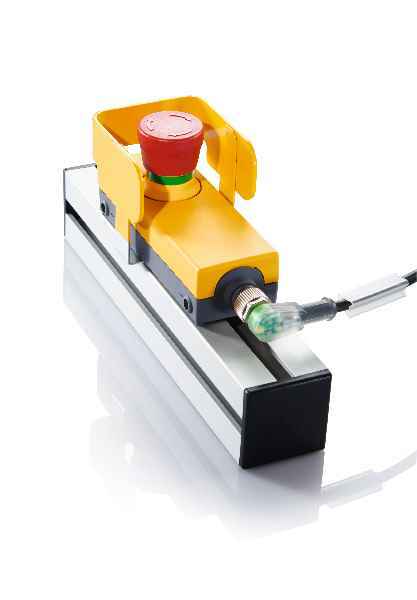 The drive lever and safely isolated sliders in the control panel are equipped with noncontact, wear-free Hall sensors with a service life that tests beyond five million operating cycles. These controls are used for continuous adjustment of the idle running mode and the rear loader. RAFI used short-travel keyswitches from its MICON 5 series for the membrane keyboard and pushbuttons and integrated redundant MICON variants for safety-critical functions. Furthermore, RAFI designed concave and convex bezels especially for Valtra. These enable easy haptic recognition of frequently used hard-key functions. „We do not impose a ready-made design on customers“, says Eduard Janez, Global Key Account Manager at RAFI. „They are able to adapt the system to their needs and freely assemble the components. This enables our customers to realize their design ideas and develop intuitive ruggedized interface controls that improve the operator experience.“ Company background RAFI group Founded in 1900, RAFI now develops and produces electromechanical components such as pushbuttons and switches, operating systems such as touch screens, keyboards, electronic components, and systems for man-machine communication. RAFI products are employed in more than 30 industries, e.g., in medical equipment, mechanical engineering, road and railway vehicles, household appliances, and telecommunications. The RAFI group operates internationally with approx. 2,500 employees at ten sites in Germany, Europe, China, and the USA. The group’s headquarters are located in Berg (Baden-Württemberg, Germany). ?? HMI specialist RAFI presents its latest technologies at the 2019 embedded world exhibition in Nuremberg, Germany, Hall 3, Stand 541. The company’s subsidiary RAFI ELTEC shows new applications and technologies from its EMS (Electronics Manufacturing Services) portfolio. HMI specialist RAFI presents its latest technologies at the 2019 embedded world exhibition in Nuremberg, Germany, Hall 3, Stand 541. The company’s subsidiary RAFI ELTEC shows new applications and technologies from its EMS (Electronics Manufacturing Services) portfolio. RAFI’s innovations include the TwinTouch touchscreen technology, which detects not only touch but also the intensity of pressure exerted on the panel. Combined touch and force detection prevents false inputs, increases operating security, and makes additional input levels feasible. Customized development of operating systems with capacitive touch displays is another RAFI highlight. Showcases in this segment include the Smart Pad 2.0 panel for Kuka robot systems as well as a premium-quality control panel for Schaerer coffee machines. Complementing these, RAFI also presents embedded control units. These ECUs can be used in operating solutions for various control and visualization tasks. This range has most recently been expanded by the Linux-based POWER-ECU control unit, which supports high-quality 3D visualizations as well as multi-touch inputs and full HD screen resolutions for displays up to 24″. EMS provider RAFI ELTEC develops and manufactures electronic assemblies and systems according to customer-specific requirements, starting from the idea all the way to the finished product. RAFI’s subsidiary specializes in robust embedded wireless and controller solutions for all common transmission standards such as Wi-Fi, GSM-GPRS/UMTS/LTE, ZigBee, 6LowPan, LLC, Bluetooth, and other wireless technologies. The customized implementation of embedded control units is also part of RAFI ELTEC’s scope of services. Meet RAFI and RAFI ELTEC at the 2019 embedded world exhibition in Hall 3, Stand 541. Complex wiring and properly sealed, dedicated enclosures often drive up the cost of fitting industrial applications with pushbuttons, function switches, E-Stops, or signaling devices. 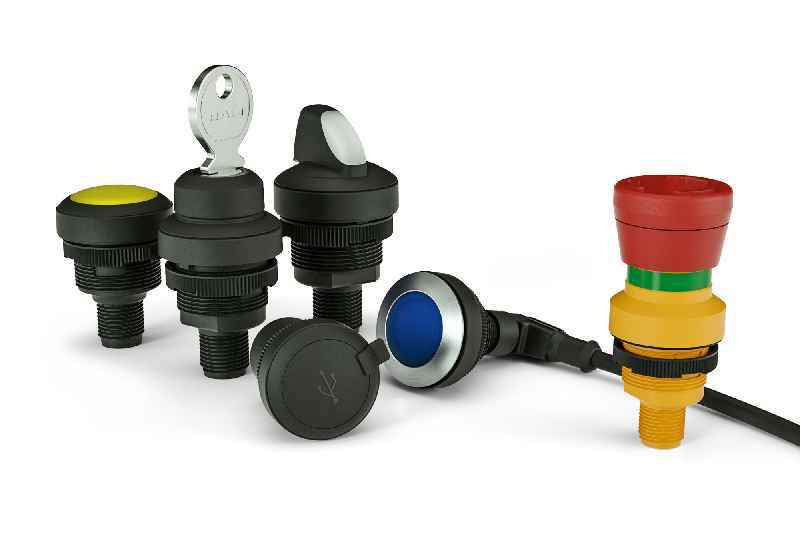 The RAMO line of control components and signal lamps provides highly economical and easy-to-install alternatives. Complex wiring and properly sealed, dedicated enclosures often drive up the cost of fitting industrial applications with pushbuttons, function switches, E-Stops, or signaling devices. The RAMO line of control components and signal lamps provides highly economical and easy-to-install alternatives. These standalone RAFI products need no extra housings or special gaskets, and they are plug-and-play ready, reducing costly wiring time and precluding mistakes. Even untrained personnel can install the devices. Due to their single-piece, fully enclosed mono-housings and connection via M12 circular plug connectors, RAMO pushbuttons, emergency stops, selector switches, key switches, and LED signal lamps can be installed in standard 22.3 mm and 30.3 mm mounting holes without any additional sealing. The RAMO EDGE 90° mounting bracket enables quick mounting of standalone RAMO components. The bracket fits on 40 mm profile rails. Depending on the type of RAMO component, the installation depth varies between 30.2 mm (RAMO 22) and 36.4 mm (RAMO 30). For applications with restricted space, devices are available with M12 connectors featuring angled cable exits. Rotated by 135°, these cable exits allow for a high packing density. The RAMO series is designed to fit the look and dimensions of the RAFIX FS+ series, allowing users to mix and match control components from both series as they wish. 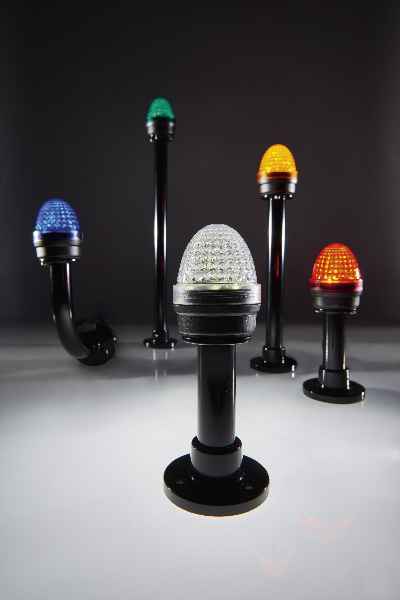 The pushbuttons are available with fully illuminated bezels in many different colors and with a normally open contact. 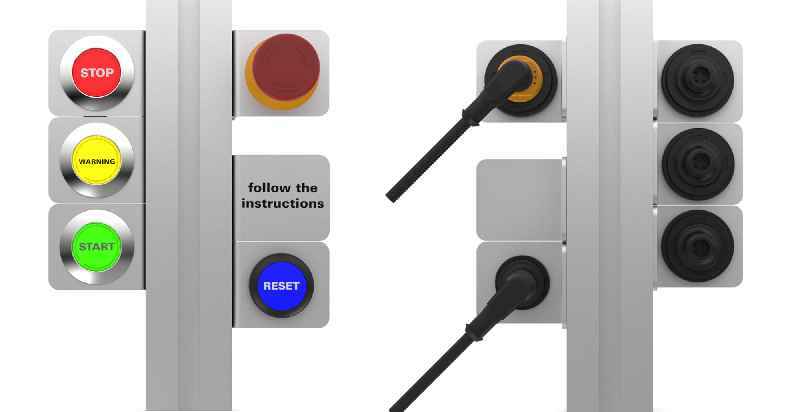 The pushbuttons can be individually labeled using the FLEXLAB system. In addition to pushbuttons, function switches, and LED lamps in five colors, the RAMO range also includes USB 3.0 and RJ45 bushings that feature the same design. A product video at https://www.youtube.com/watch?v=LO5Wcbx5eL0 presents application examples and installation variants for the RAMO series. The new LUMOTAST 22 is the first Emergency Stop button from RAFI’s LUMOTAST range for 22.3 mm mounting holes. Featuring a compact size and a low installation depth of 17.6 mm, this pushbutton is very useful whenever space above or below the front panel is limited. The new LUMOTAST 22 is the first Emergency Stop button from RAFI’s LUMOTAST range for 22.3 mm mounting holes. Featuring a compact size and a low installation depth of 17.6 mm, this pushbutton is very useful whenever space above or below the front panel is limited. The actuating element is designed to protect the Emergency Stop button against blocking by foreign objects, with its positively driven mechanism that is tamper-proof in keeping with DIN EN ISO 13850. LUMOTAST 22 versions are available with two NC or two NO contacts, or with one NO and one optional signaling contact. In addition, customers can select models sporting a night-time design with illuminated arrows showing how to release the buttons. The switching elements with silver contacts are designed for 250 V voltage and 2.5 A switching current. They provide IP65 ingress protection. The E-Stops can be installed in seconds, inserting easily into the mounting hole and secured in place by a single threaded nut behind the housing front panel. The pushbuttons are connected via 2.8 x 0.8 mm quick connectors. Alternatively, wires can be soldered to the switch contacts. Company background RAFI group Founded in 1900, RAFI now develops and produces electromechanical components such as pushbuttons and switches, operating systems such as touch screens, keyboards, electronic components, and systems for man-machine communication. RAFI products are employed in more than 30 industries, e.g., in medical equipment, mechanical engineering, road and railway vehicles, household appliances, and telecommunications. The RAFI group operates internationally with approx. 2,500 employees at ten sites in Germany, Europe, China, and the USA. The group’s headquarters are located in Berg (Baden-Württemberg, Germany). Adding to the already versatile JOYSCAPE platform, RAFI is now offering heavy-duty joysticks for outdoor machines and other applications in which control components must meet extremely demanding requirements. The platform concept enables a robust standard design base to be combined with customized multi-function joysticks. Adding to the already versatile JOYSCAPE platform, RAFI is now offering heavy-duty joysticks for outdoor machines and other applications in which control components must meet extremely demanding requirements. The platform concept enables a robust standard design base to be combined with customized multi-function joysticks. RAFI integrates buttons, rocker switches, thumb joysticks, rotary encoders, and LEDs as required. Employing wear-free noncontact electronic 3D Hall sensors for motion detection, the new heavy-duty joystick variant achieves a long operation lifetime even in the most demanding applications. It is built to sustain 5 million operating cycles even in extreme conditions and at environmental temperatures between -40 °C and +85 °C. The joystick has 110 Nm impact strength in X and Y direction. It handles pressure up to 1000 N and tensile loads up to 500 N in Z direction. The ferromagnetic, high-alloy steel housing effectively shields the sensor system for added ruggedness. The sensors are designed redundantly for superior reliability and safety. Due to its high center of rotation and large 20° tilt angle, the joystick only needs a small, 65 mm wide mounting hole. This particular design provides for very comfortable operation. In addition, it is suitable for bellows with a minimum of folds, which makes this an easy-to-clean solution. The joystick is very compact, featuring a mounting depth of only 50 mm and 77 x 77 mm flange dimensions. Company background RAFI group Founded in 1900, RAFI now develops and produces electromechanical components such as pushbuttons and switches, operating systems such as touch screens, keyboards, electronic components, and systems for man-machine communication. RAFI products are employed in more than 30 industries, e.g., in medical equipment, mechanical engineering, road and railway vehicles, household appliances, and telecommunications. The RAFI group operates internationally with approx. 2,500 employees at ten sites in Germany, Europe, China, and the USA. The group’s headquarters are located in Berg (Baden-Württemberg, Germany). RAFI presented its latest command and control technology innovations at the 2018 electronica exhibition in Munich, Germany. These include TWIN TOUCH touchscreen technology, new touchscreen control solutions from the FLEXSCAPE program, and the expanded line of RAMO pushbuttons. RAFI presented its latest command and control technology innovations at the 2018 electronica exhibition in Munich, Germany. These include TWIN TOUCH touchscreen technology, new touchscreen control solutions from the FLEXSCAPE program, and the expanded line of RAMO pushbuttons. In addition, RAFI showcased new emergency stop pushbuttons for use in handheld remote control units that clearly signal their active or inactive state. As stipulated by DIN EN ISO 13850, inactive buttons do not have the appearance of safety devices. 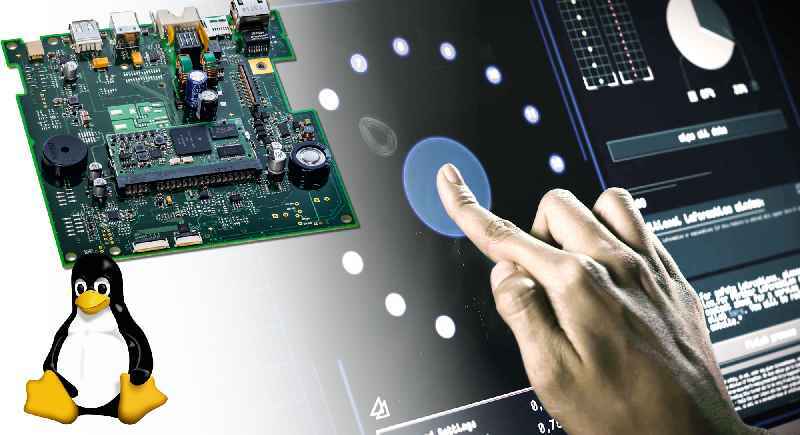 TWIN TOUCH is a touchscreen that not only detects capacitive touch inputs but also the pressure exerted on the panel. This new feature prevents false inputs through external forces; it increases operating reliability and allows the implementation of additional input levels. Pressure thresholds for input recognition can be set via software. The new FLEXSCAPE input devices for integration in touchscreens also open up new possibilities: the FLEXSCAPE ONE pushbutton is activated by touch, but is only switched when a certain pressure threshold is exceeded. Tactile feedback to confirm switching enables safe no-look operation. 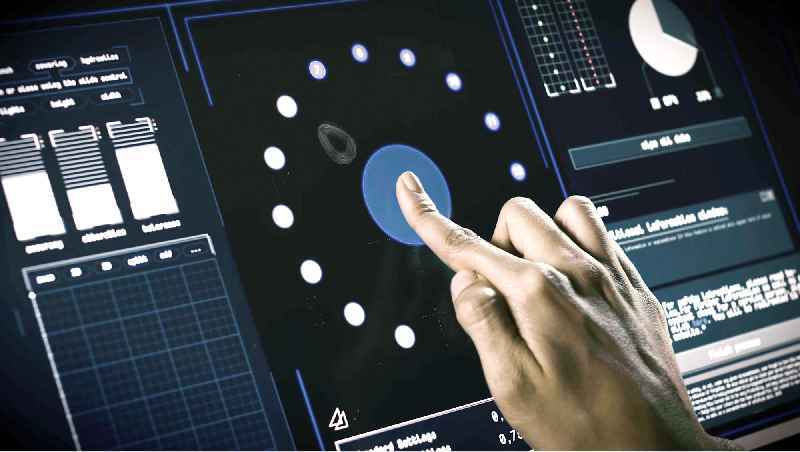 A low-cost alternative to milled contours in the touchscreen, FLEXSCAPE WHEEL is a finger guide that comes as a sticker, which can simply be attached to the glass surface. A selection from RAFI’s vast portfolio of switches was also on display, notably including new products from the RAMO series with M12 connectors: emergency stop pushbuttons, selector switches, key switches, and USB/RJ45 bushings now complement the existing range of pushbuttons and signal lamps in the RAMO lineup. Featuring single-part, fully enclosed IP65-rated mono-housings, these control elements and lamps are fully protected against spray water. They can be easily installed without additional protective enclosures and enable plug & play connection via M12 plugs. Thus, they provide an extremely economical and practical solution for fitting distributed industrial applications with individual operating and display elements. RAFI furthermore presented the new LUMOTAST 16 active/inactive emergency stop pushbutton for detachable or wireless control units. Only when the control device is actively connected, this pushbutton made of transparent colorless plastic is lit up by a red LED, as required by DIN EN ISO 13850. On inactive buttons, the light is off. Lacking the typical red coloring, the clear plastic mushroom cannot be easily mistaken for a functional E-Stop control. Visit RAFI at the 2018 electronica exhibition: Hall A2, Stand 101 Company background RAFI group Founded in 1900, RAFI now develops and produces electromechanical components such as pushbuttons and switches, operating systems such as touch screens, keyboards, electronic components, and systems for man-machine communication. RAFI products are employed in more than 30 industries, e.g., in medical equipment, mechanical engineering, road and railway vehicles, household appliances, and telecommunications. The RAFI group operates internationally with approx. 2,500 employees at ten sites in Germany, Europe, China, and the USA. The group’s headquarters are located in Berg (Baden-Württemberg, Germany). Wachowiak & Syn s.c., a Poznan-based distributor of electronic and electromechanical components, became RAFI’s sales partner for Poland in January 2018. The company and its partner ZIA employ a total of 13 people. Wachowiak & Syn has been a RAFI customer for several years. Wachowiak & Syn s.c., a Poznan-based distributor of electronic and electromechanical components, became RAFI’s sales partner for Poland in January 2018. The company and its partner ZIA employ a total of 13 people. Wachowiak & Syn has been a RAFI customer for several years. The new partnership was formally agreed upon after RAFI’s international sales meeting in early 2018. Founded in 1987, Wachowiak & Syn possesses considerable expertise, has been growing quickly and maintains an excellent network of business contacts in the Polish market. RAFI seeks to strengthen its brand in Poland and acquire new customers for its electromechanical components through this new partnership. Company background RAFI group Founded in 1900, RAFI now develops and produces electromechanical components such as pushbuttons and switches, operating systems such as touch screens, keyboards, electronic components, and systems for man-machine communication. RAFI products are employed in more than 30 industries, e.g., in medical equipment, mechanical engineering, road and railway vehicles, household appliances, and telecommunications. The RAFI group operates internationally with approx. 2,500 employees at ten sites in Germany, Europe, China, and the USA. The group’s headquarters are located in Berg (Baden-Württemberg, Germany). RAFI is considered one of the most innovative companies in Germany and enjoys an excellent reputation with its customers, this according to the 2018 Deutschland TEST survey. This customer satisfaction survey covered the 5000 largest German companies in more than 140 industrial sectors. RAFI is considered one of the most innovative companies in Germany and enjoys an excellent reputation with its customers, this according to the 2018 Deutschland TEST survey. This customer satisfaction survey covered the 5000 largest German companies in more than 140 industrial sectors. The study was commissioned by the German business magazine FOCUS MONEY. The market researchers awarded RAFI the 2018 Innovation Award for its novel products and substantial R&D investments in the development of electromechanical components, control systems, and industrial touchscreens. RAFI also won the Best Reputation seal of approval for management performance, superior product quality, excellent service, and environmental as well as economic sustainability. 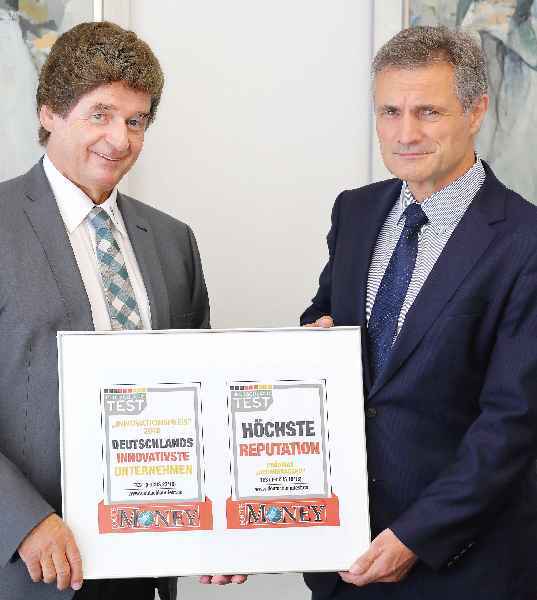 „We are very proud to accept these awards on behalf of our staff,“ said managing director Albert Wasmeier. „At RAFI, we strive to set standards through innovative developments for human-machine communication and seek to provide excellent service for our customers around the world. Therefore, this is a fine acknowledgment of our team effort.“ RAFI has an extraordinary range of vertical manufacturing and offers a very diverse portfolio of products as well as development and manufacturing services. Building on the company’s original production range of high-quality pushbuttons and switches, RAFI has diversified its portfolio and today manufactures electronic assemblies and full-scale control systems for various sectors including the automotive industry, machine building, agricultural vehicles, and medical technology. The electronics specialist is also one of the largest EMS providers in Germany and one of the few manufacturers in Europe with production facilities for large-sized industrial touchscreens. The company has won multiple awards for its vocational training program as well as for product design solutions. In the 2017 Deutschland TEST survey, it was recognized as one of Germany’s top employers. Company background RAFI group Founded in 1900, RAFI now develops and produces electromechanical components such as pushbuttons and switches, operating systems such as touch screens, keyboards, electronic components, and systems for man-machine communication. RAFI products are employed in more than 30 industries, e.g., in medical equipment, mechanical engineering, road and railway vehicles, household appliances, and telecommunications. The RAFI group operates internationally with approx. 2,500 employees at ten sites in Germany, Europe, China, and the USA. The group’s headquarters are located in Berg (Baden-Württemberg, Germany). 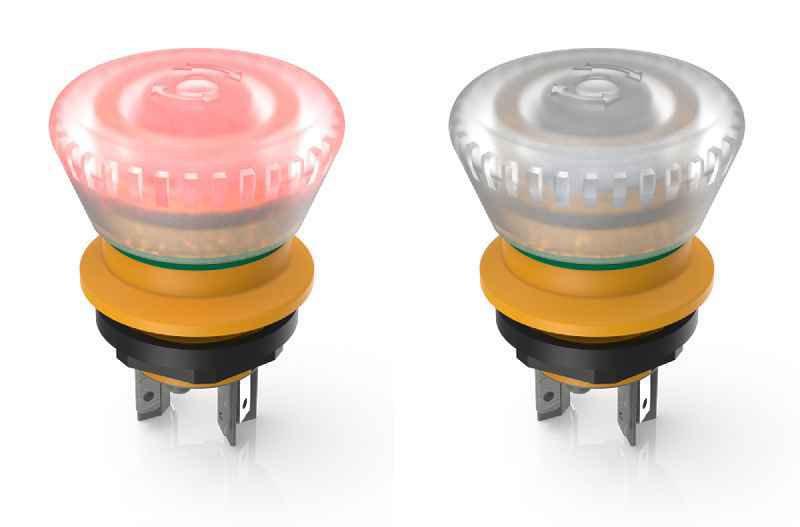 RAFI extends its LUMOTAST 16 range of compact Emergency Stop buttons, adding a version for detachable or wireless control units that actively signals whether it is connected to the Emergency Stop function of a machine or plant. 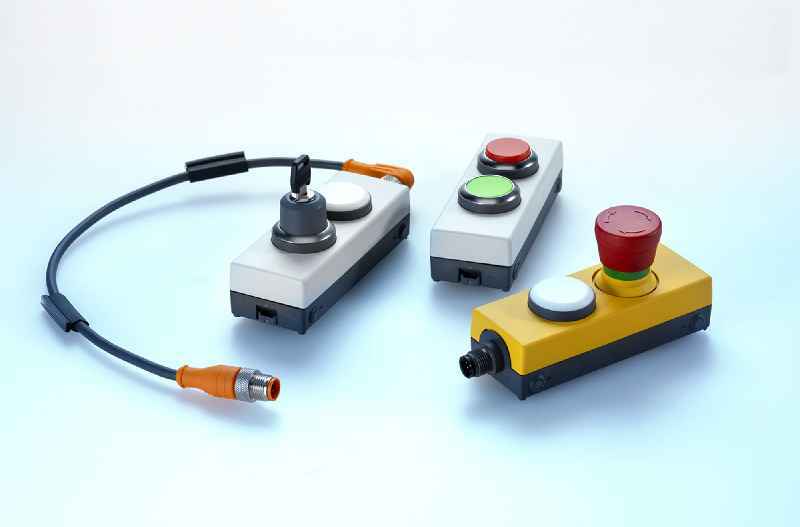 RAFI extends its LUMOTAST 16 range of compact Emergency Stop buttons, adding a version for detachable or wireless control units that actively signals whether it is connected to the Emergency Stop function of a machine or plant. Until now, machine operators had to find ways to make inactive or unconnected Emergency Stop switches (E-Stops) inaccessible, for example by covering them up or even utilizing mechanical padlocks prohibiting activation. A new, illuminated Emergency Stop button offers a more practical and attractive solution. Only when the control device is actively connected, the pushbutton made of transparent colorless plastic is lit up by a red LED. The combination of an illuminated mushroom and a yellow enclosure ensures that the device complies with color regulations for Emergency Stops according to DIN EN ISO 13850. When inactive, the light is off. Lacking the typical red coloring, the clear plastic mushroom indicates it is not in control of an Emergency Stop shutdown. It should be noted, though, that a redundant E-Stop must be installed on the machine and must be available and accessible at all times when the remote control unit is in the inactive state. The extremely compact control units from the LUMOTAST 16 series fit in 16.2 mm mounting holes. Featuring a mounting depth of 18.2 mm, they require very little space inside the housing. Their installation takes seconds: once inserted into the mounting hole, the devices are attached by a single threaded nut behind the housing front panel. They can easily be connected via 2.8 x 0.8 mm quick-connect terminals. Like all LUMOTAST 16 series pushbuttons, the E-Stops feature IP65/IP67 ingress protection, suitable for harsh and outdoor environments. Company background RAFI group Founded in 1900, RAFI now develops and produces electromechanical components such as pushbuttons and switches, operating systems such as touch screens, keyboards, electronic components, and systems for man-machine communication. RAFI products are employed in more than 30 industries, e.g., in medical equipment, mechanical engineering, road and railway vehicles, household appliances, and telecommunications. The RAFI group operates internationally with approx. 2,100 employees at ten sites in Germany, Europe, China, and the USA. The group’s headquarters are located in Berg (Baden-Württemberg, Germany). BOX, a particularly slim housing for one or two RAFIX 22 FS+ control devices, is now also available as a pre-configured unit with an M12 connector. No wiring is required for this ready-to-use solution that provides emergency stop buttons or simple ON/OFF switching functions at remote locations. BOX, a particularly slim housing for one or two RAFIX 22 FS+ control devices, is now also available as a pre-configured unit with an M12 connector. No wiring is required for this ready-to-use solution that provides emergency stop buttons or simple ON/OFF switching functions at remote locations. E-BOX features a very compact size of merely 109 x 40 x 27 mm and is suitable for mounting on 40-mm profile rails or, for instance, on protective barriers. A single screw fixes the mounting clip in the profile rail groove. Users can then simply attach the E-BOX housing – it clicks and sticks. E-BOX M12 is available as a 4-pole or 8-pole version with illuminated pushbuttons. The pre-configured range currently comprises models with an emergency stop or a pushbutton, or both, or with two pushbuttons (1 NC, 1 NO). The housing tops for the emergency-stop versions are colored signal yellow, the pushbutton ones are gray. 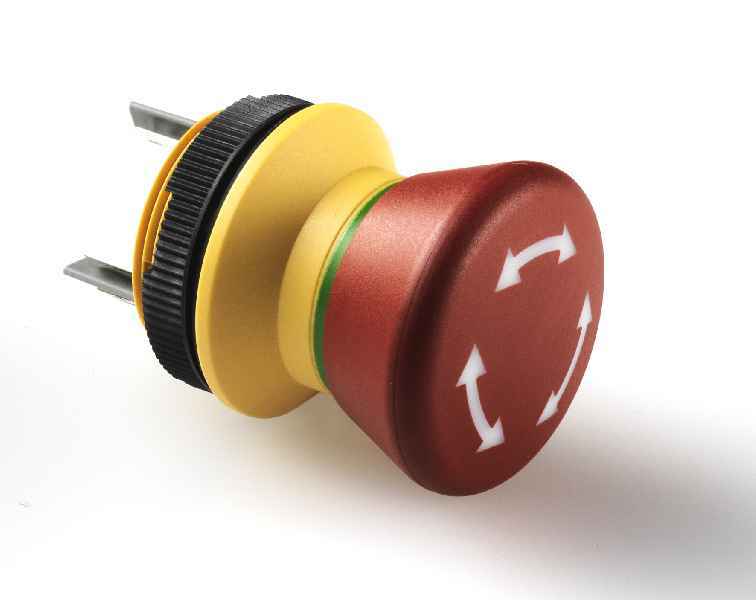 Different pushbutton designs are available for various uses: ON/OFF switches with red and green blinds (optionally flat or raised), gray pushbuttons with arrows for lifting and lowering movements. Users can individually mark the button of the single-pushbutton E-BOX model with RAFI’s FLEXLAB labeling system. The new E-BOX M12 housings feature IP65 ingress protection and a -25 °C to +70 °C ambient temperature range. Company background RAFI group Founded in 1900, RAFI now develops and produces electromechanical components such as pushbuttons and switches, operating systems such as touch screens, keyboards, electronic components, and systems for man-machine communication. RAFI products are employed in more than 30 industries, e.g., in medical equipment, mechanical engineering, road and railway vehicles, household appliances, and telecommunications. The RAFI group operates internationally with approx. 2,100 employees at ten sites in Germany, Europe, China, and the USA. The group’s headquarters are located in Berg (Baden-Württemberg, Germany). RAFIX IN THE BOX: RAFIX boxes are freely customizable and can be equipped with control components from the RAFIX 22 FS+ or RAFIX 22 FSR series. For decentralized control applications, the all-new “RAFIX in the Box” housing units give customers maximum freedom to customize the number and type of built-in control components, housing dimensions, and connectors. RAFI provides the compact control units pre-assembled and ready for connection. For decentralized control applications, the all-new “RAFIX in the Box” housing units give customers maximum freedom to customize the number and type of built-in control components, housing dimensions, and connectors. RAFI provides the compact control units pre-assembled and ready for connection. The powder-coated aluminum die-cast housings are available in standard dimensions of 57 mm or 82 mm width and 100 mm, 150 mm, or 200 mm length. The slim version takes a single row of connectors, whereas the wide version can be equipped in two rows. Customers can choose from the RAFIX 22 FS+ and RAFIX 22 FSR series of control components for their customized assembly. These products accommodate a housing height of just 32 mm due to their low mounting depth. Available actuating elements include illuminated pushbuttons with protruding or flat bezels, selector switches, key switches and mushroom pushbuttons, emergency stop buttons, signal indicators, and potentiometer drives. For use under adverse weather conditions, exposure to severe mechanical stress, or in extremely dirty conditions, RAFI recommends the RAFIX 22 FSR series of heavy-duty control components. Depending on requirements, RAFIX boxes can also be used as hand-held units. These can be fitted with optional magnetic feet to be easily attached to any metal surface whenever they are not in use. RAFIX boxes can also be mounted on walls or 40 mm profiles with accessories such as mounting clamps and brackets. Connectors for the boxes can be configured entirely to customer specifications: All common plug and cable types, lengths, and fittings are available. Thanks to their robust design with a degree of protection up to IP65, effective EMC shielding and high-quality switches and buttons, RAFIX boxes provide excellent reliability and precise switching. With a RAFIX box, customers receive a product that is immediately ready to use, featuring a housing machined exactly to their needs that comes fitted and fully wired with components according to their individual specifications. Company background RAFI group Founded in 1900 as the “Elektrotechnisches Institut” (Electrical Engineering Institute), RAFI today develops and produces electromechanical components such as pushbuttons and switches, control systems such as touchscreens and keyboards as well as electronic assemblies and systems for human-machine communication. RAFI products are used in more than 30 industries, e.g., in electrical medicine, mechanical engineering, road and railway vehicles, household appliances, and telecommunications. The RAFI group operates internationally with approx. 2,100 employees at ten sites in Germany, Europe, China, and the USA. The group’s headquarters are located in Berg near Ravensburg, Germany. Berg/Ravensburg, Germany – RAFI presents new HMI systems for smart farming at the Agritechnica exhibition in Hanover, Germany (hall 17, stand D41). Berg/Ravensburg, Germany – RAFI presents new HMI systems for smart farming at the Agritechnica exhibition in Hanover, Germany (hall 17, stand D41). 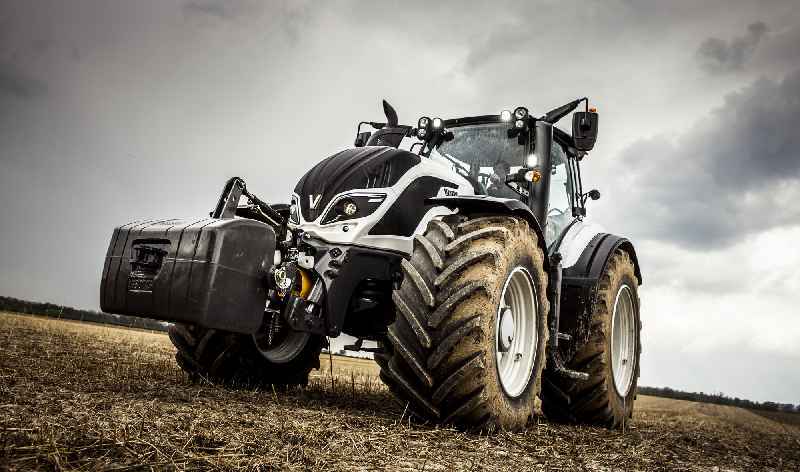 Showcases include armrests for Valtra tractors and Kässbohrer PistenBully vehicles, the Bach onboard unit manufactured by RAFI for Openmatics, agricultural tracking systems for tools and attachments, as well as solutions for continuous machine and user behavior monitoring. The new SmartTouch armrest developed by RAFI for the Valtra S series model S394 will also be integrated in N and T series rigs. This product won a 2017 Red Dot Design Award for its excellent ergonomics and well-thought-out arrangement of components. Visitors to the RAFI trade fair booth can try the farming simulator to get an up-close impression of this operating solution’s high level of comfort. The booth also features a life-sized Valtra tractor cabin model equipped with the current design with the SmartTouch armrest. 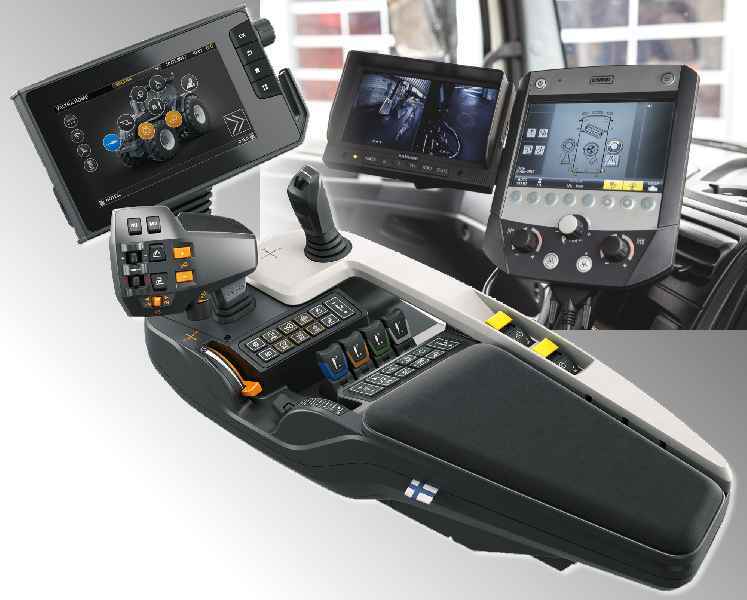 Furthermore, RAFI introduces its new control panel for the current PistenBully PB 100 series, which also integrates all control elements for vehicle and tool functions in the arm rest. The main joystick for controlling all vehicle and hydraulic functions features a sophisticated double joint functionality that allows for intuitive, flexible positioning of the plow. In addition, the handle integrates 18 switches, rocker switches, and rotary potentiometers for quick function selection, adjustment, and input acknowledgment. Kässbohrer will gradually implement consistent cockpits across the PistenBully series by equipping all models with this new high-performance solution. Another notable presentation is an „Implement Tracking“ application based on the Openmatics Bach box – a solution that demonstrates RAFI’s advanced capabilities in the field of IoT in agriculture. In combination with „deTAGtiv“ battery-powered sensor tags, the Bach onboard unit enables a networked system for localization and production data acquisition for agricultural implements such as balers, mowers, or seeders. The Implement Tracking tool makes such devices smart and enables efficient fleet management as well as significantly improved maintenance intervals. RAFI’s solution for user behavior monitoring is another trade fair highlight. Continuous condition monitoring of the armrest control unit enables an analysis of individual user behavior. The aggregate data can yield valuable insights into the system’s real-life usability and ergonomics. On this basis, user behavior can be further optimized and the efficiency can be increased. Visit RAFI at the 2017 Agritechnica exhibition in hall 17, at stand D41! Hanover, Germany, 12 – 18 November 2017 Company background RAFI group Founded in 1900, RAFI now develops and produces electromechanical components such as pushbuttons and switches, operating systems such as touch screens, keyboards, electronic components, and systems for man-machine communication. RAFI products are employed in more than 30 industries, e.g., in medical equipment, mechanical engineering, road and railway vehicles, household appliances, and telecommunications. The RAFI group operates internationally with approx. 2,100 employees at ten sites in Germany, Europe, China, and the USA. The group’s headquarters are located in Berg (Baden-Württemberg, Germany). RAFI has developed a customized four-axle joystick for the current PB 100 PistenBully series manufactured by Kässbohrer Geländefahrzeug AG. It enables the driver to intuitively and flexibly control the snow blade. RAFI has developed a customized four-axle joystick for the current PB 100 PistenBully series manufactured by Kässbohrer Geländefahrzeug AG. It enables the driver to intuitively and flexibly control the snow blade. The joystick forms part of an operating panel which is fully integrated in the armrest and was developed by the HMI specialist in close cooperation with the vehicle manufacturer. Furthermore, this device will be the standard method of operation in all PistenBully series in the future. Previously, PistenBully series were equipped with model-dependent integral cockpits with various joystick fittings and types for the hydraulic control. The heavy-duty joystick combines four axles with various technologies: While the xy setting takes care of the horizontal and vertical movement of the snow blade, a joint on the horizontal plane means the user simply turns the joystick handle to incline the snow blade. In order to implement the z-axis which is used to control the snow blade lateral opening angle, the integrated RAFI strain gages located on the handle tracklessly record the deforming lateral forces. 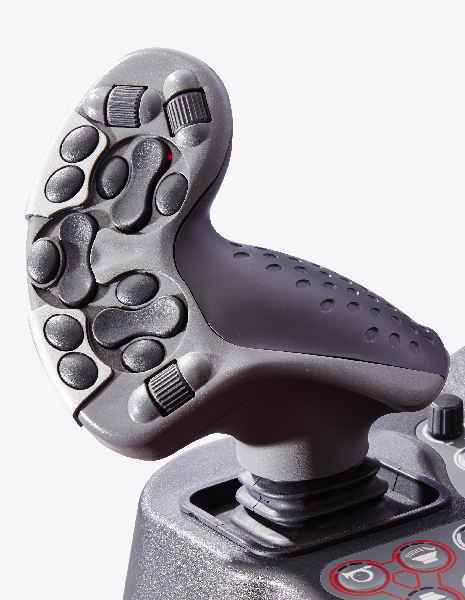 In order to enable accurate control without axial overlaps, the manufacturer had to reduce the regular clearance of its JOYSCAPE joystick platform on which the new development is based from 7/10 mm to 7/100 mm. Although the device has a total of 19 buttons, rocker switches, and rotary potentiometers for acknowledgement, adjusting, and other functions, the ergonomic handle design developed exclusively for Kässbohrer ensures easy, fatigue-free vehicle operation. The thumb field is equipped with nine tactile switches as well as three rocker switches and three rotary potentiometers from the RAFI range. Thanks to their double-click function, they give the driver an extended range of functions. The back of the joystick also features three buttons so the driver can operate it using the index, middle, and ring fingers. The adjustable holder also allows the user to adjust the joystick to five different positions for various arm lengths. The JOYSCAPE joystick platform from RAFI is available in three different sizes. Due to its modular design, it enables the manufacturer to develop and manufacture customized joysticks for professional applications extremely quickly and cost-effectively. RAFI Group company background Founded in 1900 under the name “Elektrotechnisches Institut”, RAFI now develops and produces electromechanical components such as pushbuttons and switches, operating systems such as touch screens, keyboards, electronic components, and systems for man-machine communication. RAFI products are used in more than 30 industries, e.g., electrical medicine, mechanical engineering, road and railway vehicles, household appliances, and telecommunications. The RAFI group operates internationally with approx. 2,000 employees at ten sites in Germany, Europe, China, and the USA. The RAFI Group headquarters are located in Berg, close to Ravensburg, in Baden-Württemberg, Germany. The signal lamps from the new Tilted Diamond+ series developed by RAFI together with renowned product designer Luigi Colani are characterized by special brightness, impact resistance, low maintenance properties, and an exceptional lens design. The name Tilted Diamond refers to the diamond-shaped lenses in the bezel which create a unique scattered light effect. RAFI purposefully optimized the light refraction of the lenses to achieve perfect illumination. The consistently high visibility across 360 degrees makes the lamp easy to see, even at long distances. Four extremely bright LEDs with a power consumption of only 0.63 W are located inside the lamps. The lamps are available in yellow, green, blue, and transparent/white and are maintenance-free for up to 50,000 hours. A reliable two-screw mount that can be secured from inside or outside the housing ensures rapid assembly. For connection to a 24 V AC/DC power supply, the Tilted Diamond+ signal lamps can be supplied with CAGE CLAMP® clamped connections for direct wiring or with 4-pin M12 plugs. The signal lamps with an installation height of 70.1 mm (CAGE CLAMP®) or 83.55 mm (M12) are designed for a temperature range of between -30 °C and +60 °C and exhibit a IP65 and IP67 degree of protection on the front side. The range of accessories includes powder coated support tubes which are available in 100 mm, 250 mm, and 400 mm sizes as well as a support tube in a 90° angled and 100/100 mm version. RAFI Group company background Founded in 1900 under the name “Elektrotechnisches Institut”, RAFI now develops and produces electromechanical components such as pushbuttons and switches, operating systems such as touch screens, keyboards, electronic components, and systems for man-machine communication. RAFI products are used in more than 30 industries, e.g., electrical medicine, mechanical engineering, road and railway vehicles, household appliances, and telecommunications. The RAFI group operates internationally with approx. 2,000 employees at ten sites in Germany, Europe, China, and the USA. The RAFI Group headquarters are located in Berg, close to Ravensburg, in Baden-Württemberg, Germany. ?? 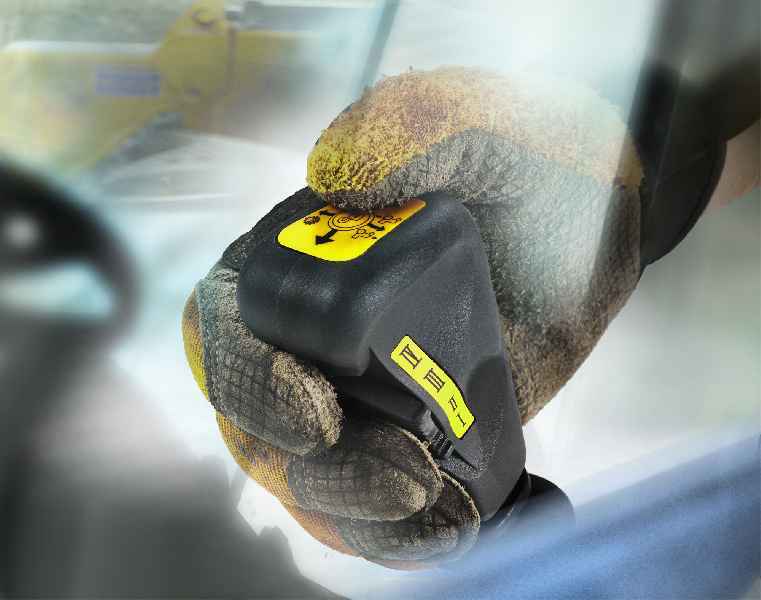 RAFI has now expanded its E-BOX range to include a protective collar which prevents accidental actuation of emergency stop buttons. The E-BOX is an exceptionally flat and slim housing for one to two RAFIX 22 FS+ series actuators. It can be used to install emergency stop buttons and pushbuttons at remote locations, e.g. for simple lifting/lowering or on/off functions. The compact sizes are based on the edge dimension of 40 mm profile rails. The E-BOX can easily be attached to the rails using an assembly clip or the protective collar that also functions as an assembly clip. To do this, a single-hole screw mount is used to fix the protective collar or assembly clip into the profile rail groove. Then the E-BOX housing is snapped into place. Alternatively, the system can be installed directly on walls or other surfaces using the screw holes in the housing / protective collar. The overall design remains slim because the shape of the actuation protection is tailored to that of the E-BOX housing. The protective collar can be combined with the E-BOX MODULAR as well as the E-BOX M12. RAFI Group company background Founded in 1900 under the name “Elektrotechnisches Institut”, RAFI now develops and produces electromechanical components such as pushbuttons and switches, operating systems such as touch screens, keyboards, electronic components, and systems for man-machine communication. RAFI products are used in more than 30 industries, e.g., electrical medicine, mechanical engineering, road and railway vehicles, household appliances, and telecommunications. The RAFI group operates internationally with approx. 2,000 employees at ten sites in Germany, Europe, China, and the USA. The RAFI Group headquarters are located in Berg, close to Ravensburg, in Baden-Württemberg, Germany. 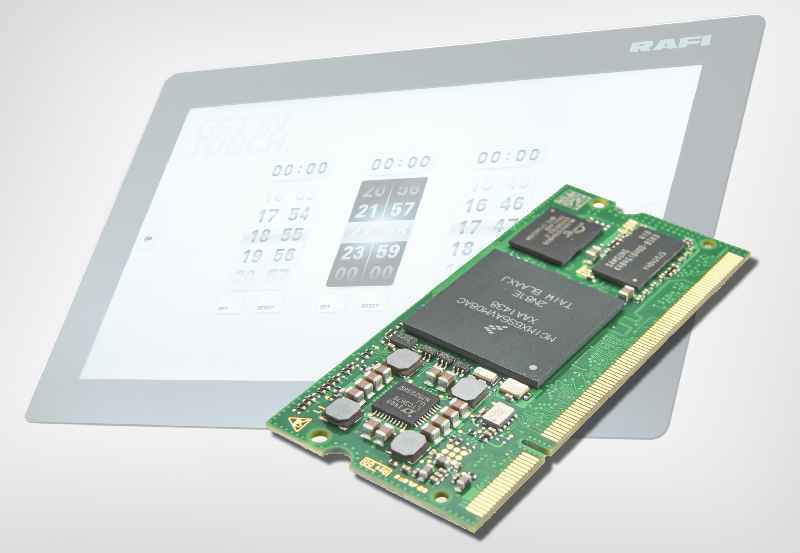 Berg/Ravensburg – RAFI, a global leader in human machine interfaces, now optionally equips the GLASSCAPE series of capacitive touch displays with powerful processing units for control and visualization tasks. Berg/Ravensburg – RAFI have presented all-new controls for agricultural and construction machinery at Agritechnika 2015: a GLASSCAPE touchscreen and wear-free joystick are complemented by the new 3D-SCAPE, a capacitive 3D touch input solution (patent pending).